Hi, it’s Leah from Simple.Home.Blessings., I’m here to share 2 duvet cover tips that will make your life SO much easier! I love the look of a duvet cover and I love how they can change the look of a bedroom so quickly. But there are a couple big things I don’t love about duvet covers. First, they are such a pain to get on and off, and second, I get frustrated that the comforter inside gets separated from the cover and I end up with a lump of comforter down at the bottom of my duvet cover. So, I came up with a couple of tricks that are super simple and ended my frustration with duvet covers. The first trick was inspired by duvet covers we purchased for our girls’ shared bedroom (they got big girl beds!). When I first put the duvet covers over their comforters, I noticed at one short end of the duvet cover (on the inside) there were two fabric straps hanging from each corner. I immediately knew what these were supposed to be for, but I kind of wondered: (1) why are there only two sets of straps, and (2) what am I supposed to tie these straps to? I came up with a solution to the problem by using an old t-shirt to create my own loops and straps for the duvet and comforter. On each corner of the comforter I attached a strap to make a loop and sewed it onto the comforter. No one will ever see the comforter without a duvet cover over it, so it doesn’t matter that my sewing abilities are novice level. Next, on the inside of the duvet cover, I sewed two straps on the corners that didn’t have straps. These sets of loops and straps make it really easy to keep the comforter inside the duvet cover from slipping down when my girls tug the covers up over themselves at night. And they make making their beds super easy, too. I have to wash our duvet covers a LOT – little kids are messy! So, I need a really easy way to get the duvet cover on, and off, the comforter. The easier the process is, the more likely I am not to put it off until another day. Place the duvet cover inside out, flat on top of the mattress, with the opening of the duvet, at the foot of the bed. Lay the comforter on top of the duvet and tie the straps of the duvet cover to the loops of the comforter. Starting at the head of the bed, roll the comforter, and the duvet cover, toward the foot of the bed. When the comforter is fully rolled up, tuck the corners of the comforter inside the duvet cover. (see picture above). Next button/snap the duvet cover at the opening. Holding the corners that were at the foot of the bed, unroll the comforter back up toward the head of the bed. It reads like it is a little bit complicated, but I promise, it isn’t! It is as simple roll it in, roll it out. I also made a video tutorial – so you can see how it’s done, and how easy it is to do! I hope these two simple tricks will help you enjoy your duvet covers more, while also making it easy to help you keep them cleaned regularly. No more that late-night tugging and fighting with the duvet cover! 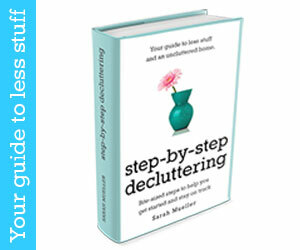 Work on de-cluttering your home with our Hope for Homemakers group. Cool! I never met a duvet ’til we moved to South Africa, and now they’re everywhere. I can manage one, sort of, but never tried the rolling thing. Gotta try it. I’ve never seen straps or loops on ours, but I’ve never really looked either. Cousin Bake Day and an Anniversary Celebration!